Masai Mara National Reserve is often referred to as a paradise on earth for its sheer variety of wildlife. Named after the traditional local inhabitants the Masai, (the semi-nomadic tribal population of Kenya), this park is one of the most prominent tourist destinations in Kenya. Masai Mara is spread over a huge open woodland, a grassland, and hills inhabited by a rich animal kingdom. Different kinds of birds, mammals, and reptiles live here. Some of the animals found here include buffaloes, rhinoceros, leopards, elephants, lions, hippos, and giraffes. Rhinos and elephants are more frequent in the bushland, whereas the hippos and the crocodiles are common in the lakes and rivers. 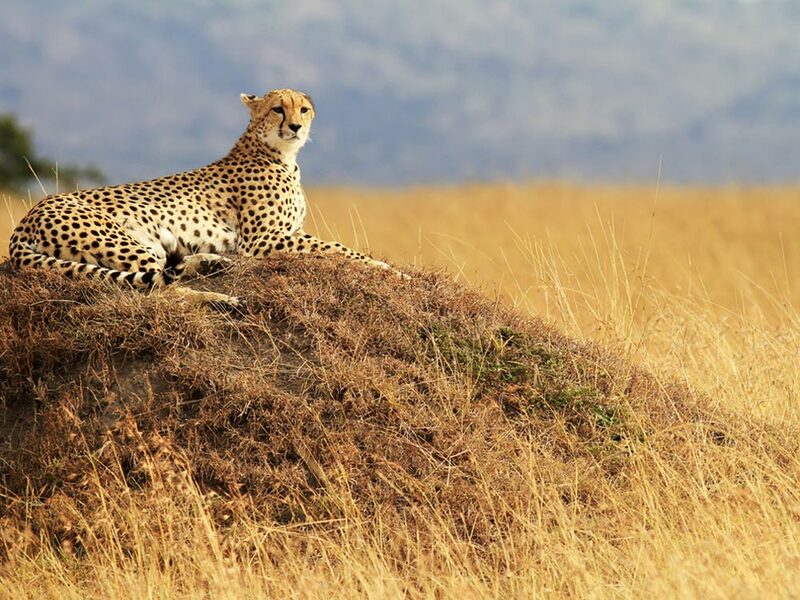 Masai Mara has a marvelous landscape with a spectacular plateau to the west, bushes and sandy soil to the east, open and gently sloping grassland, and woodland on either banks of the Mara River, which is also the backbone of the Masai Mara region. The Mara River provides shelter to a large number of crocodiles and hippos. This river flows westbound from north to south through the Tanzania Park up to Lake Victoria. Dense forests inhabited by a number of bird species border this river. A visit to the Masai Mara leaves you with a feeling of serenity; this reserve of wildlife is known for its tranquility. Diverse wildlife, a variety of birds, the magnificent landscape, dense foliage and forest, and the culturally rich local inhabitants are the major attractions of the Masai Mara region. This famous destination in Kenya is a heaven for nature lovers. Lions, buffaloes, leopards, rhinos and elephants spread across the region can be easily spotted. Game drives or safaris are a favorite of the tourists. Safari rides with experienced guides are organized by many lodges in the reserve and can be enjoyed in the morning, afternoon and in the early evening. People interested in learning about the customs, lifestyle and traditions of the locals can also visit the Masai Village. The Great Migration is another major attraction for tourists. Masai Mara National Reserve in Kenya is a popular tourist destination with plenty of amazing sights and sounds. The reserve has many lodges including the Mara Serena, Mara Sopa, and Keekorok or at the camps located in Intrepids club, Mara Sarova, Mara Buffalo and Kichwa Tembo. The campsites near River Talek are exciting locations to stay. This rich animal kingdom is a must-visit for any nature lover. Masai Mara was originally a wildlife sanctuary established in 1948 enclosing a total area of about 200 square miles. In 1961 the total area was extended up to 703 square miles within the Serengeti Ecosystem and the park was transformed into a game reserve. The management of the park was handed over to the Norok county councils. In 1974, a part of the park was given the status of National Reserve and about 61 sq. miles was given back to the traditional inhabitants; in 1976 another 63 square miles were removed from the reserve. The total area was reduced to the existing 580 square miles in 1982. In 2001, the management of the Mara Triangle and the Masai Mara was taken over by a non-profit making Mara Conservancy. Where is Masai Mara National Reserve? One of the most-frequented tourist destinations of Kenya, Masai Mara is located at the southwestern part of the country, within the Serengeti Ecosystem. Masai Mara’s eastern border is about 167.7 miles away from Nairobi. For visitors coming by flight, Nairobi International Airport is the nearest and the most prominent airport, connected by many international and national flights. From Nairobi to Masai Mara by flight, it takes about 40 to 45 minutes. There are some small airports such as Mara Serena Airport and Keekorok Airport within the reserve area, which receive flights from Nairobi and other nearby cities. By road it takes about five to six hours from Nairobi. For moving around the park, the best options are safari vehicles and hot air balloons. These are easily available within the reserve area. The months from July to October and December to February are the best months to visit the Masai Mara National Reserve as it is dry during these months. The migration of birds takes place in July and August every year. So if you are a bird lover, this would be the best time for you. As one of the rules and regulations to be followed, the visitors are permitted to roam on the roads from 06:00 am to 07:00 pm. Visitors are not allowed to come out of their vehicle.